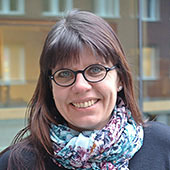 Anna Nyström Claesson is a senior lecturer in sustainable development at Environmental Systems Analysis and has long experience in teaching and developing courses in sustainable development for university engineering students. Her research interest lies within educational sciences and how students learn systems thinking for sustainable development. Her background is in Nuclear Chemistry with the focus in Geochemistry from Chalmers University of Technology and she also has a teacher’s degree from Gothenburg University. There might be more projects where Anna Nyström Claesson participates, but you have to be logged in as a Chalmers employee to see them.